We are pleased to announce that Disability Rights Nebraska recently received funding from the Woods Charitable Fund and The Nebraska Planning Council on Developmental Disabilities to start a new project – The Inclusive Education Lay Advocacy Project. To put it simply, “Inclusive Education” is what we want for students with disabilities, and “Lay Advocacy” is how we hope to achieve it. In Inclusive Education, students with disabilities aren’t separated from their classmates, and therefore, aren’t seen as separate from their classmates. An Inclusive school environment provides high-quality instruction to all students in age-appropriate general education classes in their neighborhood schools. This instruction includes interventions and supports that promote the success of every student. When students with disabilities are viewed through the same lens as those without, they are then provided the same opportunities to make friends with classmates, participate in school activities, and thrive in their school communities. The Inclusive Education Lay Advocacy project is rooted in the belief that ordinary citizens, when given the opportunity, will prove to be strong advocates for all children. We want to provide citizens with that opportunity. The Lay Advocacy Project will provide training, based on a proven model, to citizens who commit to attending meetings and standing with other families in advocating for children with disabilities. Additionally, the Project will offer Individual Education Plan clinics to help families understand their rights and responsibilities for developing and implementing inclusive education plans. We aim to provide advocates and families with the information they need to understand and enforce legal rights, negotiate systems, and overcome the various hurdles to acquiring inclusive education for students with disabilities. The benefits of inclusion are clear. 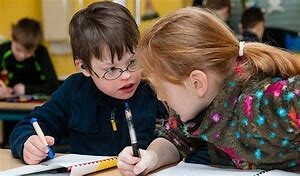 Students with disabilities have opportunities to develop friendships, access to the general curriculum, enhanced skills, higher expectations, fewer behavior referrals, etc. Students without disabilities also have opportunities for friendship in addition to an increased appreciation for diversity, respect for all people, better test scores…the list goes on. The arguments in support of Inclusive Education are strong – strong enough to call Nebraska citizens to action. Help us make this the norm for students with disabilities. If you or somebody you know is interested in working with or becoming a Lay Advocate, contact our Lay Advocacy Project Coordinator, Pat Cottingham, EdD at 402-474-3183 or patriciac@drne.org. Tess Barnes is an Media and Program Assistant for Disability Rights Nebraska. She earned her Bachelor’s degree in Journalism with majors in Psychology and Advertising/Public Relations. In her free time, Tess enjoys traveling, reading and spending time with her cats.